Indie Game Music Bundle 2! Quick SPSA (shigi public service announcement, haha): For just 4 more days, you can pay whatever you want to get 5 really awesome indie game soundtracks as part of the 2nd Indie Game Music Bundle! This bundle has some really great music from games like Aquaria, Swords and Sworcery, and To the Moon. If you do pick up the bundle, please let me know what you thought of it — Did you enjoy the music? What were your favorite tracks? 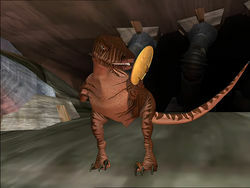 Also, quick RSS (random shigi story): At dinner last night, we were talking about my favorite character (the noble Dinobot) from Transformers: Beast Wars. George decided to quote a line from a pivotal moment in the series, “What is a warrior without his weapon?” Right then, the waitress walked by to refill our drinks, and she was like, “A DEAD WARRIOR!” But she said it so zealously that she accidentally overpoured the drink and it all came spilling out all over the table, haha… I don’t know why, but I thought it was so hilarious.